It just wouldn’t be Christmas without cookies, would it? As much as hanging our stockings and running out of Scotch tape, cookies have become an intrinsic part of the way our culture celebrates the holiday season. Every family I know has their own unique and highly personalized cookie tradition. When I was growing up, it was jelly thumbprints and chocolate chip meringues. Maybe this doesn’t sound very Christmasy to you, but all I have to do is taste that buttery dough with a bit of raspberry jam and I am instantly transported to the Christmases of my childhood. I have since realized that making those two cookies together also represented an ingenious way to not let any eggs go to waste: thumbprints got the yolks, meringues the whites. In my husband’s house it was- and still is- his mother’s amazingly addictive sugar-cookie cut-outs with icing and sprinkles. The famous family story about them involves Sharon making them far in advance one year, in an attempt to get ahead of the holiday mayhem, only to find that the boys had discovered her stash and eaten ALL the cookies in advance- perhaps also to get a jump on the holiday season. When I grew up, I learned from my cousin Gretchen that our family had a much older cookie tradition that had been brought over from the old country called “Flettin.” Every November, weeks before the holiday season really got underway, the family women would convene and proceed to spend the entire day rolling, cutting, and frying dough. After being sprinkled with a mixture of powdered sugar and cinnamon, the delicate little things would be wrapped in linen and stored in the attic (!!) for several weeks to let them “age,” which presumably made them even more crunchy and crispy. I don’t know about you, but I’m pretty sure in my house the attic mice would do a number on these cookie baskets similar to what my husband and his brother did to his mother’s big green Tupperware bowl. Nonetheless, in recent years our family has revived the Flettin tradition. It’s more of a production these days, since everyone is coming from all across New England rather than from down the block or across town, but all the planning pays off when we finally arrive at one of our houses and settle in to tie on the apron strings. Even with the dough prepared in advance- a very strange recipe involving lots of sour cream, separated eggs and kneading (who kneads cookie dough? )- it takes pretty much all day. We always set up an assembly line with the Flettin veterans at the fryers and novices and kids on cookie cutting and sugar-sprinkling detail. For years Gretchen had been threatening to send the story of our Flettin tradition to the King Arthur Flour’s magazine The Baking Sheet– with hopes they would finally resolve some of our long-standing debates: has anyone else ever heard of this recipe? Do we really have to separate and whisk the egg whites, only to knead and pound the dough after their addition? And honestly, was that aging in the attic thing a real step, or yet another clever strategy for getting a head start on the holidays? 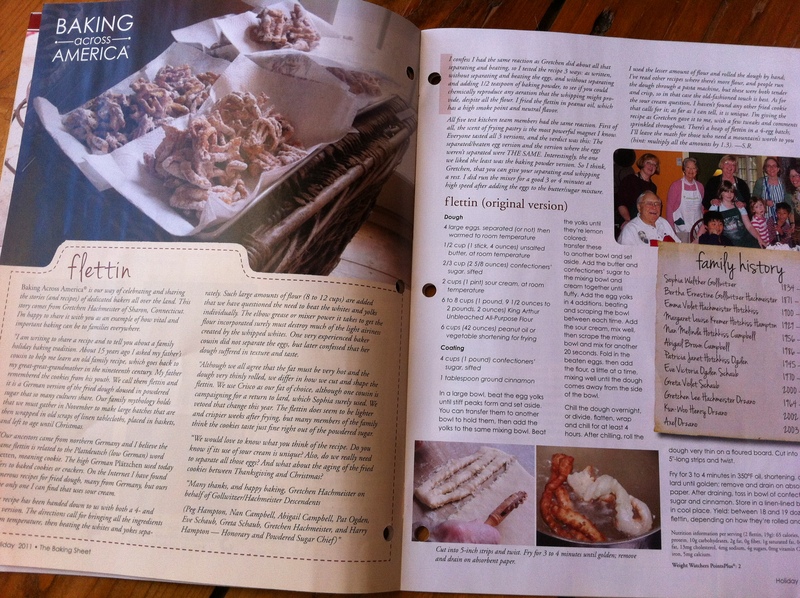 Gretchen really did send our story in, and, amazingly, they published it in their 2011 holiday issue. If you find a copy, you can read all about it, see pictures of our family, the cookies, and find out what they thought about our quirky family recipe. We all thought that was pretty cool. But that’s not really the point, I think. Cause you know what? Flettin are a lot of work, part of our family history and a wonderful Christmas tradition, but psst!… they’re not THAT good. I mean, they’re good. But is that really what we drive several hours for? What we slave over a hot fryer all afternoon for? “Linen in the attic” instructions notwithstanding, in my opinion they always taste best that day, warm from the fryer, freshly sprinkled and eaten while surrounded by family, some of whom you won’t have the opportunity to see again till we do this next year. We don’t have much in the way of family heritage, so Gretchen and I are holding onto Flettin tight: it’s not really about the cookies as much as about the fact that they’re our cookies. As it turns out, this year the family didn’t manage to get together for a Flettin day, so I didn’t have to confront what it would mean in light of No Sugar- too bad. 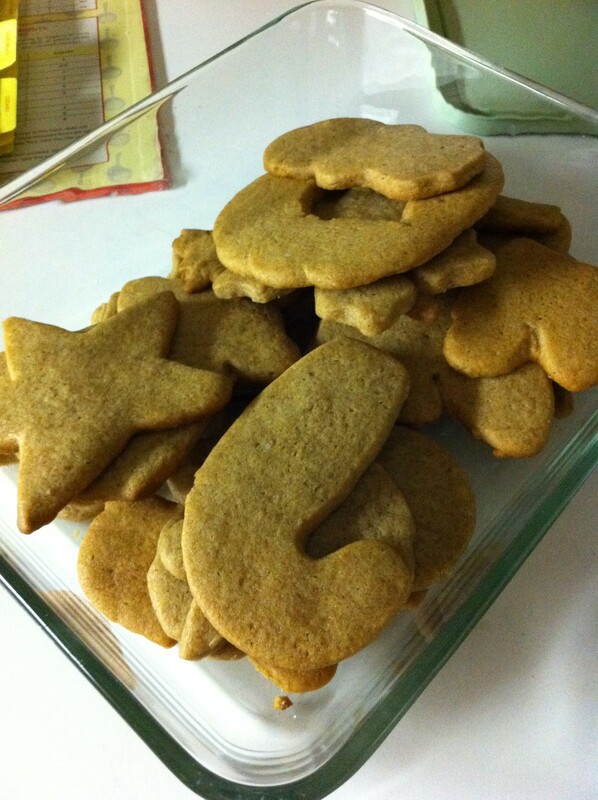 Instead, I’ve been creating some oxymoronic recipes at home such as No-Sugar Sugar Cookies and Dextrose Gingerbread. They’ve so far gotten good reviews from my helpers and harshest critics- the kids. Thus, despite all our fretting, I have a sneaking suspicion that a No Sugar Christmas will work out just fine. 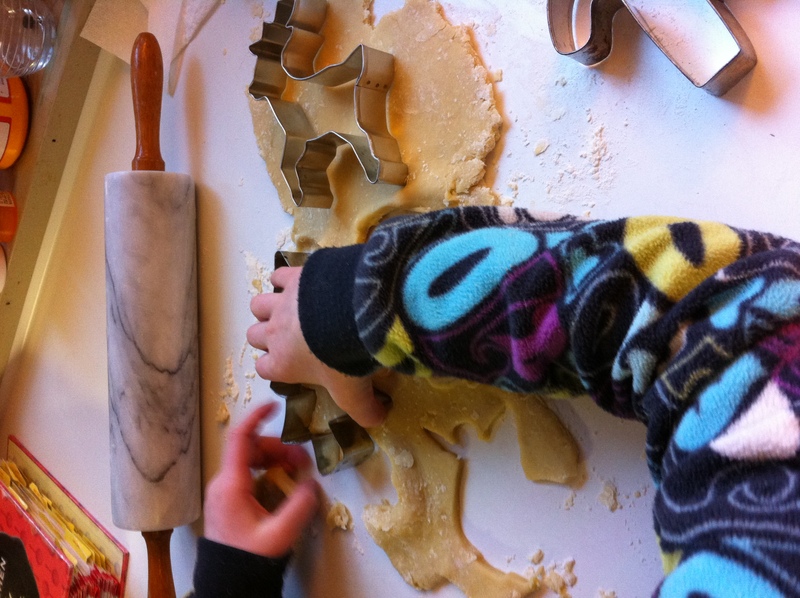 Sugar or no, the most important part of these cookies will be the fact that we baked them, and ate them, together. You are currently reading A Year Of No Sugar: Post 91 at Eve O. Schaub.